The New Zealand AIDS Memorial Quilt and associated archive has been gifted to Te Papa, and is now housed in the museum for posterity. The Quilt is a profound and significant taonga – representing the many people who died of AIDS in New Zealand during the devastating epidemic in the 1980s and 90s. The Quilt is made up of 16 blocks (measuring about 4 x 4 metres) – each block is made up of 8 panels – each panel represents a person who died of AIDS. They were made by family members, partners, friends, and are moving testaments to their love and support. Many of the panels are over 20 years old, but their power of remembrance, love and grief is just as strong as when they were first created. And they’re powerful regardless of how they’ve been made. You would expect them to be beautifully made by experienced sewers, but they were sometimes quite simply put together with whatever materials were at hand – rubber foam, paint, photographs, glue, glitter – even soft toys have been attached to the panels. In the particular Quilt block pictured here, there is a three-dimensional camera in the bottom left panel made from foam rubber, vinyl and plastic. Not one of your normal quilting methods! But this Quilt block is particularly special because it includes the first panel to be made in New Zealand – for Peter Cuthbert who died in 1988, an early New Zealand victim of AIDS. The Quilt was farewelled from Auckland on Sunday 29 April in a beautiful ceremony at St Matthew-in-the-City. Te Papa was represented by myself as the curator, Sara Guthrie (Collection Manager), and Dame Claudia Orange, who spoke movingly about Te Papa’s care and respect for the Quilt. 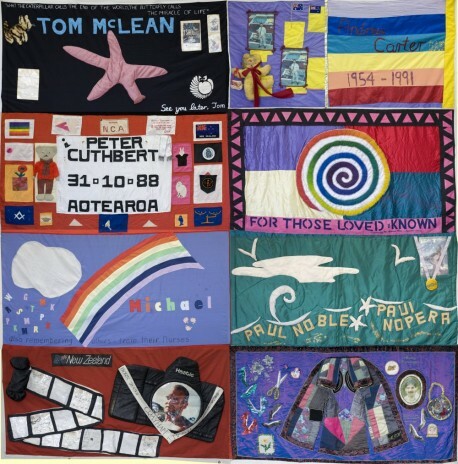 This Thursday, Te Papa will formally welcome the New Zealand AIDS Memorial Quilt onto its Marae. We will display two blocks to the public from 10am to 2pm, and Michael Bancroft, Guardian of the Quilt, will give a talk into the fascinating history behind our Quilt and Quilt projects around the world (12.15pm on the Marae). Now, how about a quilt for all the aborted babies??!! Isn’t all life supposed to be precious? That’s awesome, are there any plans to exhibit the quilt? It would be amazing to see. Not sure how you could logistically though. Cheers. There are not current plans to display the quilt, but images will be made available online soon and viewings by request.